You want to break the rules? Well, you need to master them first. 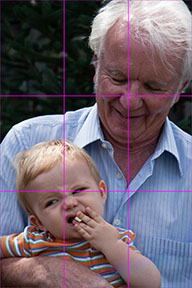 Here we explain the famous photography rule of thirds. Check out the Two Minute Tips video on the rule of thirds! 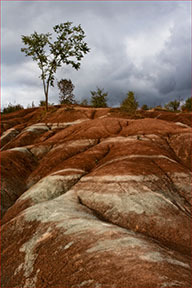 The rule of thirds is probably the most often referenced photography rule of composition. It is all about subject placement within the frame. First of all, imagine that your picture space is divided into thirds both horizontally and vertically, like a tic tac toe grid. Grid for the rule of thirds. 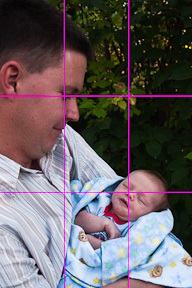 The photography rule of thirds tells us to align our subject with one of the points where those lines cross. That means our subject is one third of the way “into” the picture space – from either the top or bottom, and from either the left or right. And that means it’s not in the middle. It is interesting to note that we refer to the most significant element of our image as the “center of interest.” The word "central” is a synonym for “important.” It comes as no surprise, then, that we instinctively place the subject of our image in the center of the frame. Bullseye! It’s only natural to line up the camera with what we are paying most attention to. 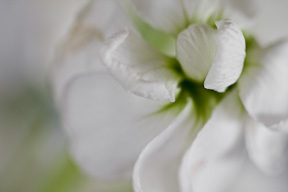 It takes some conscious thought and careful composition to place your center of interest off-center. However, the result is much more pleasing to the eye. Placing it at the intersection of the tic tac toe lines (also known as the thirds position) produces a nicely balanced image. The turtle’s eye is in the thirds position. Central placement of objects is static. If an object is an equal distance from all sides, there is no implied need to move. The object is balanced, and therefore at rest. There’s no tension, no tug in either direction. Now, this is where the photography rule of thirds becomes a guideline. If balance is what you are trying to express, then central placement of your subject may be just the way to go! 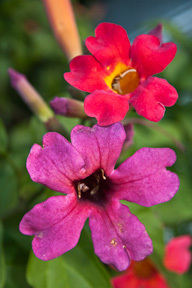 Many amateurs place flowers right in the middle. An off-center composition with a diagonal element is more pleasing. 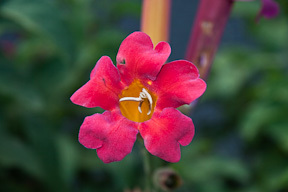 Central placement of the flower is predictable and static. Off-center placement is more appealing. 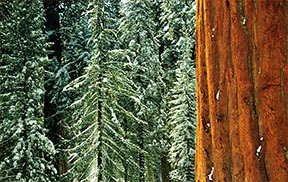 Two thirds green trees, one third sequoia. You can enhance the picture composition even more by creating a counterpoint. If you place your primary focal point at the thirds position, you can place a secondary focal point at the diagonally opposite thirds position, as in the following images. 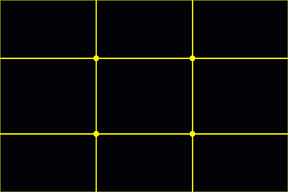 Main and secondary focal points at diagonally-opposite thirds positions. 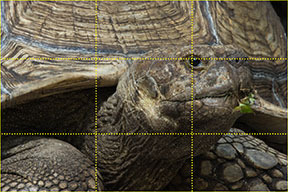 A natural extension to the photography rule of thirds is to place your horizon line along the one-third or two-third line of the tic tac toe grid, rather than in the middle. Once again, fight your natural tendency! 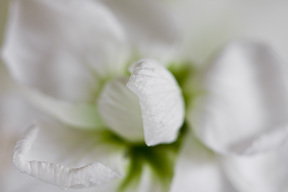 Without being taught otherwise, most amateur photographers will place their horizon in the middle. This ends up looking dull and uninteresting. Two thirds land, one third sky. Whether you place the horizon closer to the top or closer to the bottom of the picture space depends on which you want to emphasize more: the land or the sky. 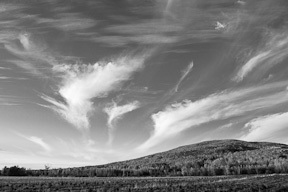 If you have a dramatic sky, by all means, give it two thirds of the picture space! One third land, two thirds sky. You can “stretch” the photography rule of thirds for a more dramatic effect by placing your horizon (or your main subject) even closer to the edge of the frame, as in the above example. See the section on visual weight to understand the effect of doing this. Why does the photography rule of thirds work? Some people believe that it’s because it’s a rough approximation of the Golden Mean (also known as the Golden Ratio or Divine Ratio). The Golden Mean defines a spiral pattern that shows up repeatedly in Nature, in everything from a nautilus sea shell to a sunflower, to the spiral form of the galaxy itself; it occurs in more natural subjects than you could imagine, making it no coincidence. Since there’s obviously something special in Nature about this form, it makes sense that humans would be naturally attracted to it – after all we’re part of nature too! You definitely don’t need to know this to take good pictures!! But for those who are "geeks" (like me 🙂 who want to know, here’s the math behind it. 1, 1, 2, 3, 5, 8, 13, 21, 34, 55, 89, …. The ratio of each pair of consecutive numbers approximates phi, or the number 1.618. (5 divided by 3 is 1.666, 8 divided by 5 is 1.60…) By the 40th number in the series, the ratio has stabilized at 1.618, accurate to 15 decimal places. the golden ratio of 1.618:1. A Fibonacci spiral is formed by connecting the arcs (quarter circles) joining opposite corners of the squares. And voila! A Fibonacci spiral! 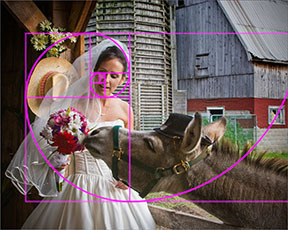 The Golden Mean and the photography Rule of Thirds don’t quite line up, but they’re close. So you can avoid taxing your brain with all that math, and take the lazy route! Just follow the rule of thirds ;-). 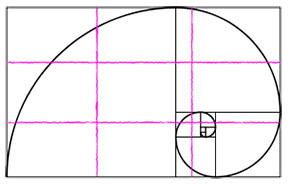 The Fibonacci spiral in black, and the rule of thirds in pink. Close! The Fibonacci spiral in action. Now, don’t get too hung up on following this spiral pattern in your compositions. The rule of thirds is a good approximation, and over time you will develop an instinct for what works. You will find that you naturally gravitate to this pattern for some of your compositions without going hunting for spirals! And do note that I said "some!" Not all compositions should or will follow this pattern. I recommend you read the next of the photography rules of composition: positioning your subject.